Best LiPo Battery Brands - Price, Performance, Lifespan. I know, stating "Best LiPo RC Battery Brand", is on the same level as telling you what beer is best; it's totally personal preference, and everyone has their own opinion. In this hobby, there are lots of opinions! I'm also not a hot shot 3D, F3C, or speed sponsored pilot with unlimited resources. Like most average folks in the hobby, I have to budget my pennies and stretch my dollars. In short, my top pics are based on best for the price! Hopefully that means the same to you as it does for me - "getting the most performance and life out of your packs for every dollar you spend." One thing I have learned over the past decade now of electric RC flying is the old adage you get what you pay for doesn't apply in the slightest to LiPo's. We will find out why shortly. On top of all that, due to new safety shipping regulations which started in 2014 in many countries (Canada where I live being one of them), it's almost impossible to order LiPo packs from outside your own country; meaning many of us are pretty much stuck to what's available from local and national hobby shops. These shipping problems are also driving costs of LiPo's back up! Here in Canada for example, it's almost getting too expensive for the average Joe or Jane to fly large electric powered planes and helicopters due to rising LiPo costs. I was hopeful this was a short term hiccup, but it's now 4 years later and as I said, it's getting even worse. At any rate, people often ask me what the best LiPo brand is and what RC LiPo batteries I personally use & recommend. So without further ado, here are my brands of choice that I currently fly with, and are immensely happy with. 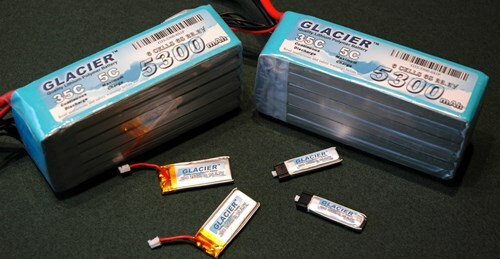 My number one LiPo battery pick right now has to be Buddy RC's Glacier LiPo's. I have been so impressed with these LiPo's over the past several years since Dale started carrying them. The other nice thing is they all come with the AB clip connectors on the JST-XH balance plugs adding yet more value. I personally feel the Glaciers are just as good as Gens Ace & Pulse Ultra (my 3rd picks) at pretty much the same low cost as Turnigy NanoTechs'. 2nd on my recommended LiPo list as I mentioned is HobbyKing's Turnigy and Zippy LiPo batteries. 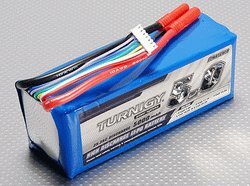 I first stared using Turnigy LiPo's about 8 years ago while getting into larger electric helicopters (600 size and larger). Before finding Turnigy, I was dishing out about $250 beans for a single 6S 5000 mAh battery pack (FlightPower & ThunderPower was what I was using way back then). Turnigy is what (pardon the pun), "turned" things around and finally made large electric flight affordable for me. That same size, capacity, and C rated Turnigy pack was only $60.00 bucks; so less than 1/4 the price of what I was using. More and more brands are now getting competitive with Turnigy and Zippy. As I mentioned several years back, even if you hate dealing with HobbyKing, it was their Turnigy, and Zippy LiPo batteries that drove, and continue to drive LiPo pricing down across the board. If price is the ultimate deciding factor, Turnigy LiPo's are hard (perhaps even impossible), to beat for the sheer value and decent performance! I do like them better than Zippy, but that is only based on my experiences with both. My 3rd & 4th best LiPo picks go to both Gens Ace, and Pulse Ultra. I have several of both and they are top notch performing LiPo's right up there with Glaciers'. They are generally around double the price of an equivalent Turnigy or Glacier, but they are still much less than most other "big name" packs. The guys at RotorQuest here in Canada originally got me into Gens Ace & Pulse Ultra. Very happy to report they are impressive and very good quality LiPo packs for a decent price! Living in Canada, they are pretty much our only affordable good LiPo options right now. I have searched high and low, both online and off, for a best LiPo source for Pulse and Gens here in Canukistan, and RotorQuest always has the best pricing and selection I find. Another added bonus is shipping is free from RotorQuest as long as your order is over $100 (pretty easy with a couple larger LiPo packs). They also have regular sales on almost every holiday weekend with discounts from 10% to 25%, and there are no import fees attached. In other words, when you take into account shipping (which always was expensive from Hobby King even before they stopped shipping to Canada), and if you wait for one of RotorQuest's regular holiday sales, especially the 20 & 25% off ones. You can pick up a Gens or Pulse for about the same price as a Glacier, and not too much more than a Turnigy. 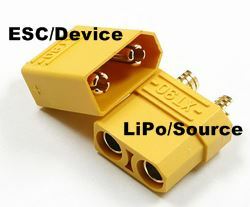 I cover this topic in depth on my RC LiPo Battery Connector page, but thought I should at least make mention of it when discussing best LiPo batteries. You'll need to make sure the battery you choose also comes with the correct plug on it that your model's ESC uses. Problem is, you really limit yourself and your LiPo battery selection when you are trapped by something as simple as the connector type it comes with. If you don't know how to solder RC connectors (which I have instructional videos on that connector page), I really encourage you to learn this most useful skill. You won't regret it - I promise! My dad taught me to solder when I was eight. If an eight year old can solder, anyone can. This is a hobby after-all, and part of electric RC'ing is simple soldering. As I said, it's not difficult, soldering equipment (a soldering gun, solder, and flux) is inexpensive, and it's such a useful skill that has far reaching applications over and above that of RC. Not only that, even if you find the best LiPo battery for your needs and it comes with the correct connector type, you most likely will have to replace it due to wear & tear. Plugs have finite cycle life after-all. Same goes for the plugs on your ESCs, even more so. Learning to fly an RC heli, plane, or even an easy and boring fully stabilized quad copter is much harder than learning to solder. Work on that easy skill so your best LiPo battery choice is not narrowed substantially by something as minor as what connector it comes with. I go over soldering equipment again on that connector page and on my RC helicopter tools page if you need help choosing what equipment to get. So, to sum this entire page up, here are my four best LiPo brand purchasing tips. If you live in the United States; I strongly feel you can't go wrong with the great value, performance, and after-sales support you will get with Glacier's from Buddy RC. For those of us in Canada; Gens Ace & Pulse Ultra's from RotorQuest give the very best quality for the price, again with great after-sales support. For those world wide that might have a Hobby King warehouse in their respective countries, or still allow cross boarder/international LiPo shipping; Turnigy / NanoTech & Zippy remain to be the least expensive quality LiPo packs. The cost savings however comes at a price - next to no after-sales support should you need it. Most of these brands (as you have likely seen above), are also offered on eBay and Amazon; so don't rule those sources out as there are often good bargains to be found. Some total rip-offs as well! Lastly... Learn to solder if you don't already know how, to greatly expand your LiPo choices. 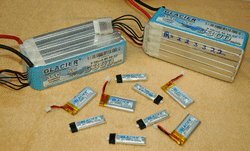 I still very much maintain supporting your LHS or national RC hobby shop is always the best source for LiPo packs, (sometimes the only economical source due to all the new LiPo shipping restrictions). However, big name RC LiPo batteries in my opinion were, and many still are, way overpriced & over hyped. Especially now knowing that pretty much every RC LiPo pack under the sun, no matter what name tag is stuck on it, comes out of China from perhaps only a handful of LiPo manufacturing facilities. I have even read that up to 75% of every RC LiPo battery on the market comes from a single facility! Many of the cheap and lower quality brands out there (none of which are listed on this page mind you), simply use cells that have failed to meet the higher specifications standards set by higher-end brands. These "hi-end rejects" are then sold for less to the lower quality brands that have more lenient specs.